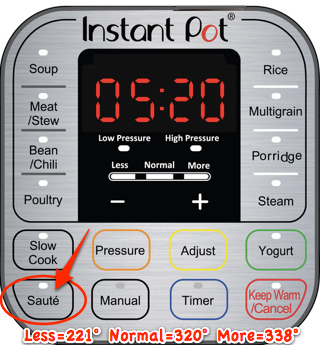 Summary: I LOVE my Instant Pot (also known affectionately as an iPot, InstaPot, Insta Pot, or even just the IP)! But I will be the first to admit that it can be a little daunting getting comfortable with it at first! 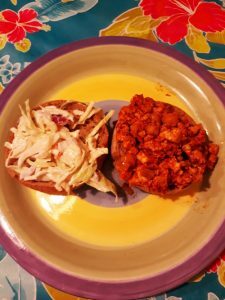 So, here are a few tips that have really helped me to finally 'get' it, plus instructions for something that you can make in your Instant Pot that will change your life: baked potatoes in 12 minutes! I LOVE my Instant Pot (also known affectionately as an iPot, InstaPot, Insta Pot, or even just the IP)! But I will be the first to admit that it can be a little daunting getting comfortable with it at first, and it can feel like it has a pretty steep learning curve. So if you are feeling a little intimidated by your new Instant Pot, you’re not alone! Plus, the manual does not include certain information that I, at least, was looking for. Such as, how long is each pre-programmed cooking cycle? Exactly what temperature do the various sauté settings heat to? What sorts of things fit inside the Instant Pot for pot-in-pot (PIP) cooking, and just what is pot in pot cooking? Things like that. First, it is almost impossible to mess up with this thing to a point of being dangerous, so if you’re concerned about the exploding pressure cookers of yore, you needn’t be (I said “almost”, don’t go overriding your pot’s safety features and then blame me when you poke an eye out). The lid audibly tells you when it’s sealed (when you turn it clockwise), and the pot won’t even build up much pressure if you haven’t properly closed the steam release handle by turning it, too, clockwise. The most likely point at which a problem could arise would be if you try to open the lid (by turning it counter-clockwise) before all of the pressure has been released and normalized (so don’t do that). 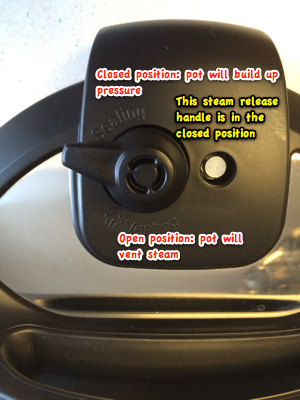 The pot visually lets you know when it’s safe to open the pot, by the float valve (the little silver post that pops up when the pot is pressurized) dropping back down flush with the lid instead of being popped up. Think of the float valve as the reverse of a turkey pop-up button, in the case of the float valve it’s done when the button pops in, instead of out. For pressure cooking, you will probably use ‘manual’ nearly all the time (nearly every Instant Pot cookbook I’ve read relies on the manual setting almost exclusively). So don’t feel badly for not using all of those other buttons very much, if at all (I’ve never used any of the preprogrammed buttons). The preprogrammed settings each have their own timing, and variable pressure, which the pot manipulates by manipulating the temperature of the contents (the higher the temperature, the higher the pressure). That is primarily what makes them different from manual, which provides one consistent pressure (either high or low). However they generally bring the contents to high pressure, fluctuating the temperature a little so that the pressure fluctuates a little too, for a set period of time. The main exceptions to that are the rice and multigrain settings. Personally I just find it easier to use ‘manual’ and set the time that I want, even for rice. After you hit ‘manual’ to start cooking, you then set the amount of time you want it to cook at pressure, after which you will have a 10-second grace period (for example to add more time, etc. ), after which the display will switch to displaying the word “on”. Then it will be a while before the display switches to the timer countdown. This is normal. The amount of time you enter is for how long it will cook after it reaches full pressure (either high or low pressure, depending on what you selected). Put another way, once the pot reaches the correct pressure, the display will switch from ‘on’ to display the cooking time, and then the timer will start counting down. The cooking time in any recipe is the time at full pressure, not in total. So you need to take into account the time it will take to reach full pressure (which depends on many variables, including what is in the contents of the pot, what temperature they started at, and your altitude), and how long it will take for the pressure to be released and normalized (i.e. for the float valve to pop in, which of course is really “dropping in”, but you get the point). And this brings us to the two different types of pressure release. All Instant Pot recipes will include (or should include) either one of these terms: natural pressure release (also known as NPR), or quick pressure release (QPR or QR). What these mean is simply either “let the pressure dissipate on its own” (natural pressure release), or “force the pressure to escape immediately by turning the steam release handle counter-clockwise to the open position (quick release). The reason for using quick release (QR) is not because you are too impatient to wait for natural release, but because your food will be over cooked if you don’t get it the heck out of dodge once it’s done cooking at pressure. On the other hand, lots of (if not most) foods need the natural release – it’s part of their cooking process and processing time. Natural pressure release generally takes between 15 and 20 minutes. Quick pressure release takes about a minute, plus the hours spent in the ER if you forget to KEEP YOUR HANDS, FACE, AND ALL OTHER BODY PARTS AWAY FROM THE STEAM VALVE WHEN YOU DO IT!! Many people put a towel over the valve before they turn it, to help suppress the steam, which you may want to do (I don’t because then I just end up with a scalding hot towel – but I also rarely need to do QR, and those times that I do, I’m sufficiently respectful of the power and heat of that steam to keep my distance). Finally, in my experience, unless you are doing a “dump everything in at once and turn it on” recipe, you will definitely want to have all of your ingredients ready to go before you start cooking. For example, for any recipe that includes sautéing in the pot first, then adding ingredients and then starting pressure cooking, you definitely want to have everything lined up before you start. Ok, I think that those are about all of the things that I had wished that I had fully understood on my first day with my Instant Pot. Now, here are the the best accessories (in my opinion) that you will want for your Instant Pot. You definitely will want this steamer basket for your Instant Pot (the Instant Pot comes with a little steaming trivet, but this steamer basket is way more useful – in fact it’s how you make the baked potatoes). Actually you will want *a* steamer basket, but trust me, this is the one you want, both because of the big handle, the fact that the handle telescopes, and, most importantly, you can use it with or without the little legs flipped down, and when you flip the little legs down, they give you plenty of space for as much water for steaming as you could ever need without worrying about the water touching the food that’s in the basket. Or, instead of, or in addition to, the above steamer, you can get this steamer basket and steaming rack / trivet set. The legs on this trivet are an inch and a half high (the rack that comes with your Instant Pot only gives 3/4 of an inch of clearance). and the flat-bottomed steamer is very versatile. Personally, I have both, as they each serve their own purpose, and the trivet that comes with the set is really useful for pot-in-pot cooking, at which you may also want to try your hand. 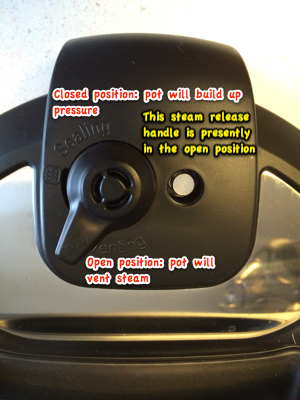 Pot-in-pot (or “PIP”) is where you put a second, smaller vessel inside your Instant Pot’s main internal pot. There are different reasons for doing this, ranging from “I only want to cook a small amount of something like oatmeal” to “I want to cook a cheesecake in my Instant Pot” to “I want to cook two different things at the same time in my Instant Pot” (like cooking beans, and having a bowl of rice on a trivet (see why you want a good trivet?) above the beans, steam cooking at the same time). For pot-in-pot cooking, I recommend any stainless steel vessel that is no greater in diameter than 7.5 inches, and no taller than 4 or so inches (your internal pot has a diameter of just over 8.5 inches and a height of about 6 inches). Lots of people use glass vessels such as Pyrex or Corningware, but I personally prefer to use stainless steel because if you drop it you’ll just have a mess, rather than a mess plus broken glass. If you’re really keen on making cheesecakes, steamed puddings, flans, and that sort of thing in your Instant Pot, you may also want to grab this stainless steel pot-in-pot ‘dessert insert’ pan set, which includes two stacking pans. and a rack to set them on which has handles that close up over the pans to secure them. You will also want this separate glass lid that is sold by the Instant Pot people. This lids fits on your inner metal pot, and this way when you are using your Instant Pot for non-pressurized cooking, such as when using it as a slow cooker, or with the sauté function, you will be able to see what is going on in there. Basically, in these usages, you can think of your Instant Pot as a counter-top stove burner (albeit one with really cool bells and whistles) – that may help you to understand why you want a (see-through!) lid for that inner pot. Plus, once you are done cooking in any mode, you can use the inner pot to store the leftovers in your fridge, and use this lid to cover it. If you also are vegetarian or vegan, you’ll appreciate the recipes in O M Gee Good! Instant Pot Meals, Plant-Based & Oil-Free by Jill McKeever. Remember how I said you could make baked potatoes in 12 minutes? And remember how I said that the recipe times are for the time at pressure? ;~) Still, even given the time to come to pressure, and to have the pressure come back down, you can have perfectly steam-baked potatoes in under half an hour, and the best part is that you can start them, and then walk away! When you are ready for your potatoes, they will be perfectly done and waiting for you, held at a perfect temperature, even if you have abandoned them for hours! Just put water in the bottom of your Instant Pot, flip the legs down on your Oxo steamer, put the steamer in the pot and then dump your potatoes in on top of the steamer. Using the Manual setting, set the cooking time for 12 minutes, using high pressure. Then walk away! Now, because these are ‘steam baked’ (i.e. cooked whole over steam, but not in water), the skins will not be crisp, but these are otherwise exactly like the baked potatoes you know and love – they’re great with butter, sour cream, etc.! This works with new potatoes, and regular potatoes! Want another easy recipe? Check out our original Instant Pot Fruit Crisp recipe!